Step 1 Heat the oven to 350. Prepare a charcoal fire or heat a grill or grill pan. Step 2 Cut the endives in half lengthwise and toss with 1 tablespoon of the olive oil and some salt and pepper. Place them cut side down in an ovenproof saute pan. Scatter a few thyme sprigs and the lemon slices over them and pour the chicken stock over. Bring to a boil. Remove from the heat and cover with foil. Step 3Place in the oven and cook for 15 to 20 minutes, until the endives are just tender at the core. Remove from the stock and cool. Cut the endive halves into quarters and brush with oil. Set aside. Step 4Sort and wash the cherries; discarding any that are bruised. If you find any in clusters, leave them intact as they look beautiful on the plate. Toss the cherries gently in a bowl with 1 tablespoon olive oil, a pinch of salt and pepper, and 2 tablespoons noble sour or balsamic vinegar. Step 5Put the cherries in a roasting pan and cover with foil, then place in the oven. Roast for 15 minutes, then remove the foil. The cherries should appear to be "sweating"; roast for an additional 15 minutes, uncovered, until the cherries are just starting to wrinkle and release some juices. Be careful not to over roast. Remove from the oven and cool. Reserve the roasting juices. Step 6Toss the radicchio leaves with 2 tablespoons balsamic vinegar and 1 tablespoon olive oil. Season well with salt and pepper. Prepare the frisee the same way. Step 7Grill the endives over a medium-high flame (you are looking for some color and to pick up some smoke), about 2 minutes. Remove the endives. Reduce the heat and place the radicchio on the grill or grill pan to char, being careful that the flame is not so high that the leaves will become papery, about 30 seconds to 1 minute. Remove the radicchio from the grill. Add the frisee to the grill over high heat to char and wilt just slightly, about 30 seconds to 1 minute. Remove these to cool a bit. Step 8To assemble the salads, lay a couple of radicchio leaves on each of the plates. Fan out two of the endive quarters as well. Curl the Serrano ham on and around the chicory. Scatter a handful of the wild arugula over the top. Break the frisee off the core and sprinkle leaves over everything, doing your best to make the salad look light. Step 9Scatter cherries around the plates, using about 8 to 10 per plate. Sprinkle each plate with the almonds. Give the salads a good drizzle of the roasting juices, some extra virgin olive oil and a touch of the almond oil. Finish with a few more drops of noble sour or balsamic vinegar. In Recipes-list.com we have selected the most viewed recipes from category - Grilled Quick and easy Salads . Enjoy the best recipes specially selected for you! 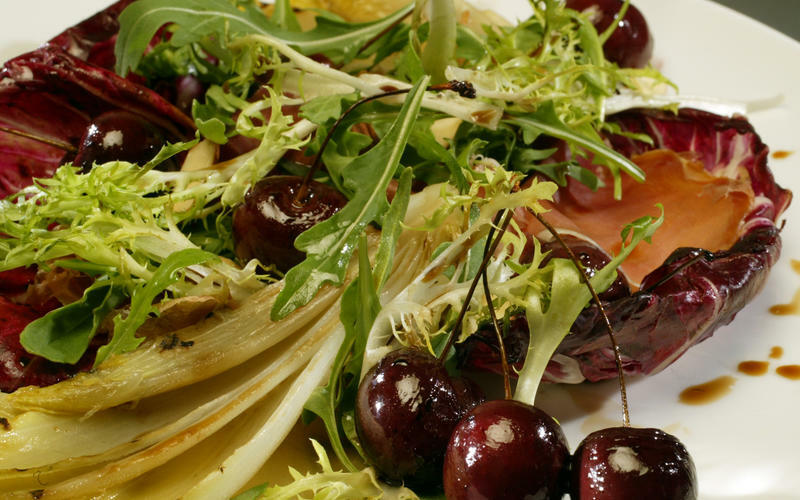 Bing cherries, Serrano ham and grilled chicory is the right choice that will satisfy all your claims.